Most dogs really enjoy having a swimming pool to splash around in. As you can see by the picture, our Bruno has had a swimming pool. In fact, Bruno has had about 3 swimming pools, but he has eaten all of them. This year I plan on getting him one that will hold up. A Bruno-Proof Swimming Pool and I think I found just the right one. I always try to save my money because I believe that it would be well worth it. In fact, I know it will be worth it. There is no telling how much money I will end up spending on the plastic ones. No more! I want one of these great Swimming Pools for Dogs that are made out of truck liner material and are Chew Resistant. It is made by OneDogOneBone and Made In The USA. 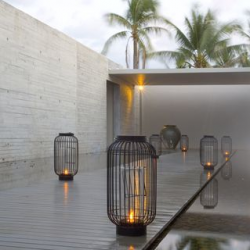 This pool is easy to drain and to clean which means a lot when you are shopping for one. It is white which helps keep the water cool. I enjoyed reading the Amazon reviews especially the one from the owner of 7 pit bulls. 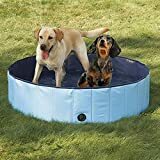 The description on Amazon reads that this Swimming Pool for Dogs will last and is chew resistant. I sure hope they tested this out on a chewer like Bruno. 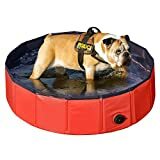 Oh, I know this is a lot of money but Bruno really enjoys the water, and I figure I will have spent that much in a couple of years buying the cheaper ones over and over again. This one holds 85 gallons of water and is Made In The USA. Now, it comes in sand, blue or pink, also! 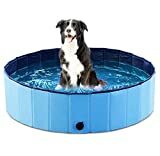 This Looks Like Best Dog Pool Ever! It also comes in a Paw Shape – sees below. I think they are a great investment, I think. It will give your dog an opportunity to use up some of that energy especially if he/she is an indoor dog. Do you have a small dog? If so, this Paw shaped doggie swimming pool might be just what you need. 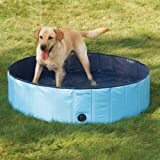 Sturdy and smaller than the Bone Shaped Dog Swimming Pool. This one is flexible so can be drained by pulling up on one side. With this smaller size, you do not need a drain. New colors now available so you can get this pool in the sand, pink or blue, too! Bruno loved to swim in the big pool, but sometimes I just didn’t have the energy to get the life jacket on him and watch him. Our grandson and his friends enjoyed the pool, but they don’t particularly enjoy Bruno joining in their games. This photo was taken when the boys were in the big pool and Bruno wanted to join them so much! He just looked out the window with such a sad face and cried to go out. Update: Our pool is gone as stated above, and so is the little fenced in area. Now, we have the whole pool area as a Doggie Park and a perfect place for this great Swimming Pool. One day when Bruno was just a year old, he jumped into the deep end of the pool. I was so scared because as I have mentioned before, we had always heard that bulldogs could not swim. I jumped in to save him (with my phone in my pocket) and thank goodness my grandson was already in the water. He actually ended up bringing Bruno to the ladder. I used to be a lifeguard many, many years ago and just reacted, I guess. Anyway, we went to get him a life jacket that very day and he has not been near the big pool without it on since then. Whew, we don’t want to take any chances of anything happening to this dog. He is such a joy to us! Our pool was destroyed in flood July 13, 2013, so we will all miss it. We are thinking of making that area a Doggie Park for Bruno. That’s right, our Bruno has eaten three of his swimming pools, so this year I am going to get him a really nice one that he can’t eat. (I hope). I want the bone shaped one on this page. 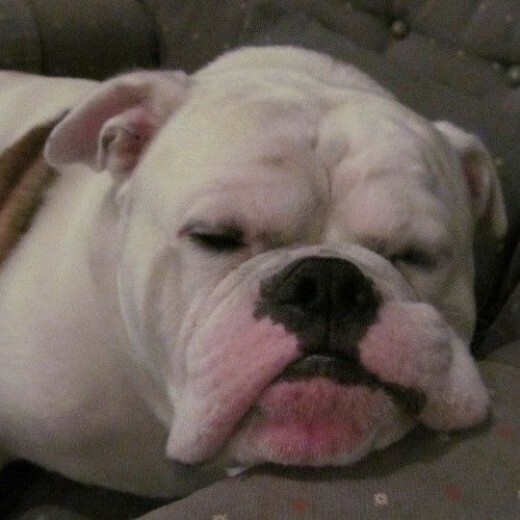 I had always heard that Bulldogs should not get near the water because their heads are so large. Well, our Bruno loves the water as you can see in these videos below. We have a smaller fenced in area next to the pool so this summer I will put him in that pen and let him play in his pool while the big boys are in the big pool. Hopefully, that will make him happy. 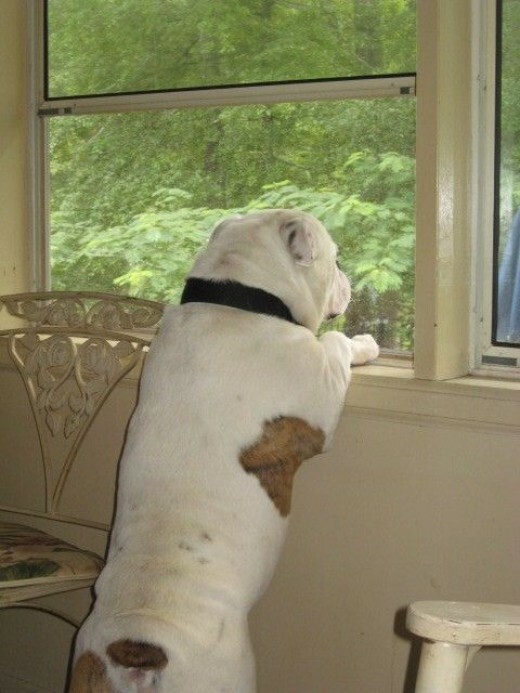 Bruno is patiently waiting for his Dog Bone Swimming Pool – “Patience is a Virtue”, Bruno! Bruno is patiently waiting for his Dog Bone Swimming Pool – “Patience is a Virtue,” Bruno! I hope you will sign my guestbook, so I will know you were here. Your comment will appear when approved. Thank you! I would love to hear about your dog if you have one. Does your dog like the water? Thanks for visiting!